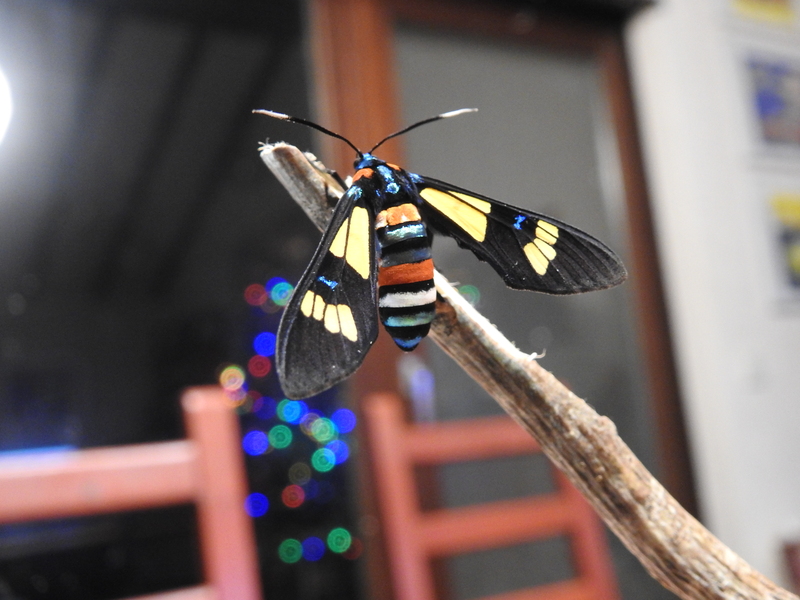 Euchromia folletii — “Wasp moth” | Welcome, visitor! 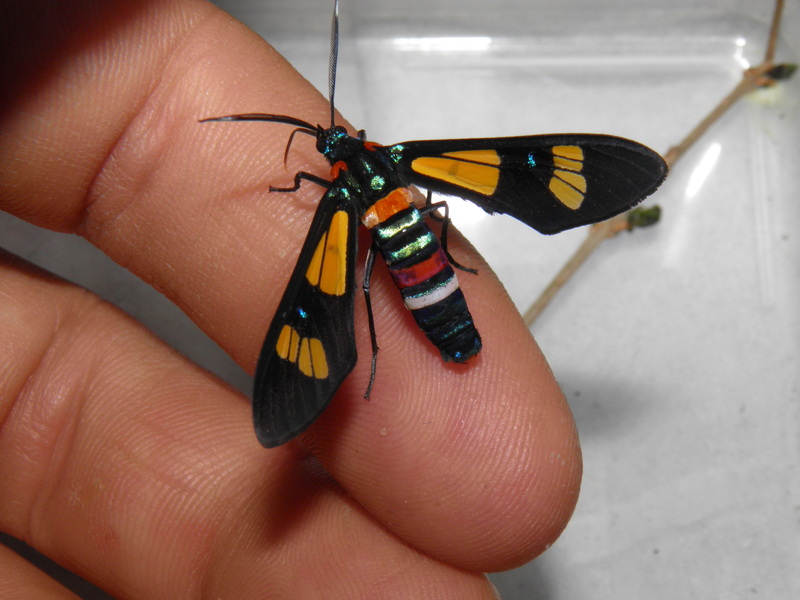 Without a doubt, Euchromia folletii is one of the most beautiful and colourful Arctiinae moths that one can raise in captivity. 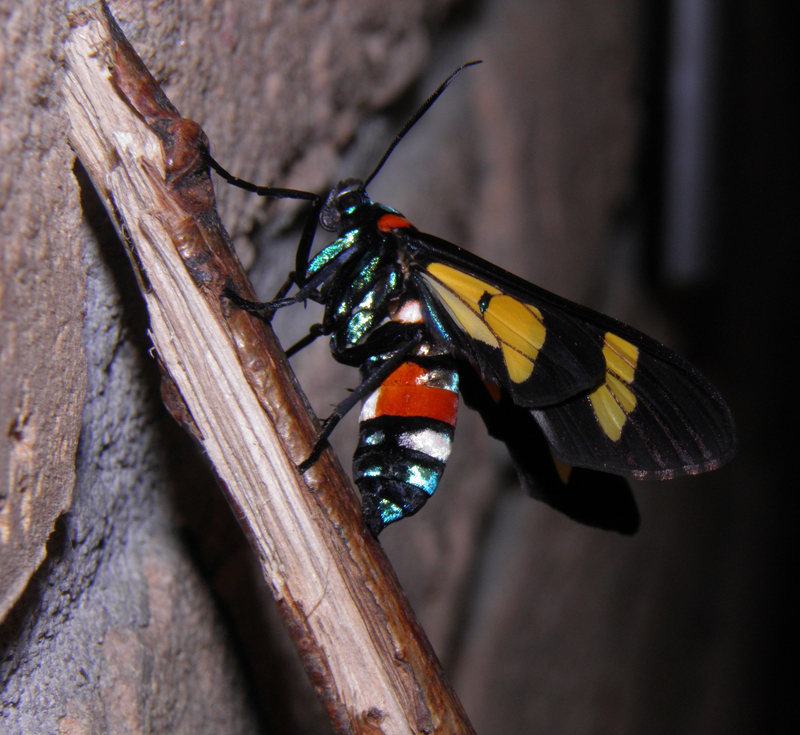 Originating from Africa, these dayflying moths can often be spotted in low vegetation, or feeding on flowers. On the internet and in literature their name is also often spelled as “Euchromia folletti” or “Euchromia foletti” and even “Euchromia folleti” (and many variations thereof) but I believe the correct scientific name to be “Euchromia folletii (Guérin-Méneville, 1832)”. That is double L, double I but single T! The name of this moth is often misspelled (something I am guilty of too). 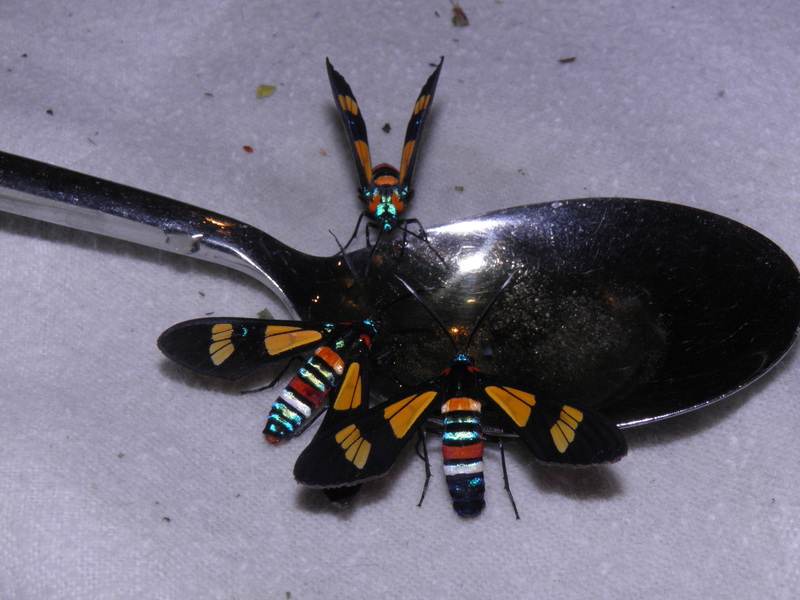 A complete dream for any moth lover and entomologist; these wasp moths are truly highly iridescent living gemstones. Showing a spectrum of red, black, yellow, iridescent silver, light and dark blue, they are one of the best species I have been able to raise and write a caresheet about. Difficulty rating: 6/10 (Raising the larvae on dandelion is very, very easy. However, pairing is more difficult since adults need daylight [sunlight/UV] and proper feeding for reproduction). 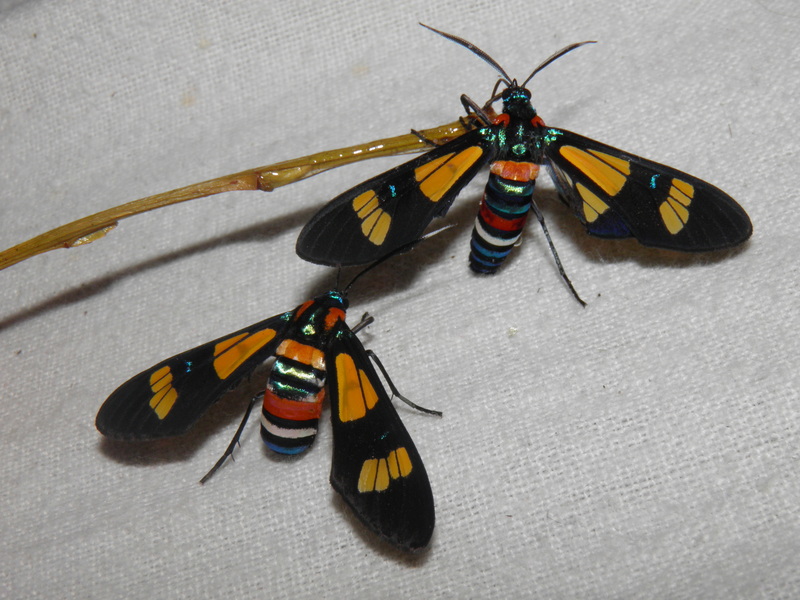 Euchromia folletii is a very colourful species of wasp moth from Africa. The moths are diurnal (day active) and thus need to be provided some light, warmth and also sufficient food (the adults of this moth feed). Rearing them in captivity is suprisingly easy, and a great number of them can effortlessly be raised. 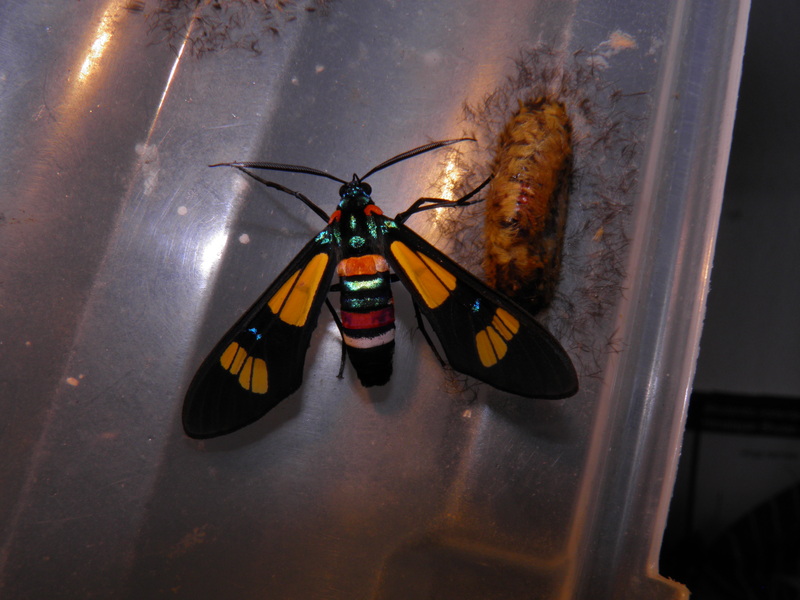 The greatest challenge is pairing them in captivity; there is more to them than just putting them in a cage and waiting for it to happen, as seems to be the best strategy to pair most moth species. 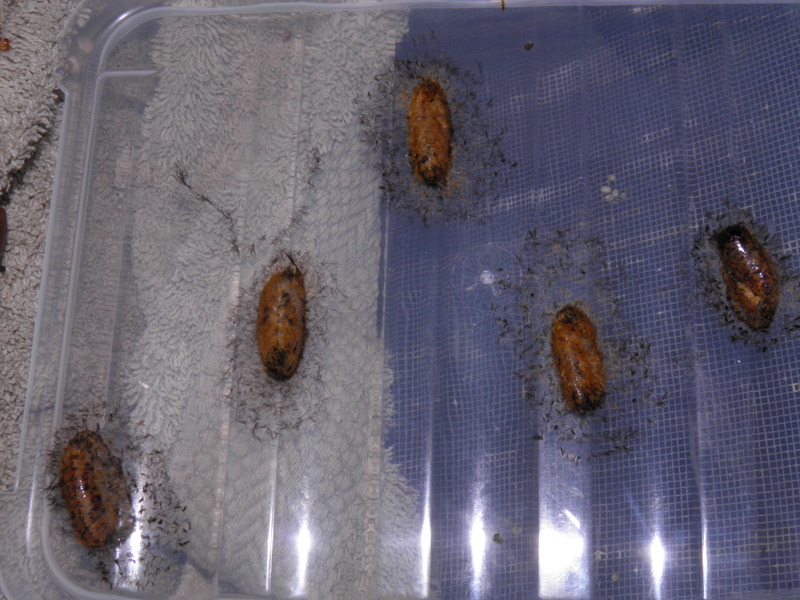 The eggs of Euchromia folletii hatch in about one to two weeks depending on temperature. Upon hatching the extremely tiny larvae are hardly visible. Take care when changing the food plant and replacing leaf litter, for these miniature hatchlings may be easily lost. In this stage they can be safely placed in closed airtight plastic containers upon food plant, such as Prunus or Taxaracum (cherry or dandelion)The larvae of Euchromia roam the vegetation and will feed on a wide range of plants, namely from the families of Asteraceae, Convolvulaceae and Fabaceae [Leguminosae]. In captivity they are easily raised on dandelion (Taxaracum), clover (Trifolium), Robinia, bindweed (Convolvulus) or sweet potatoes (Ipomea) and also some Rosaceae, such as Prunus. 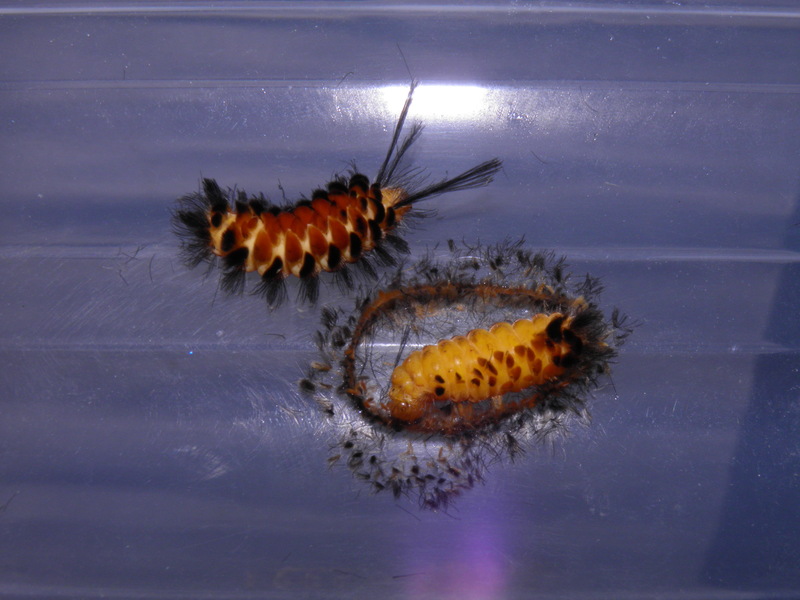 The caterpillars of Euchromia folletii are bright yellow and mostly naked although covered with smaller patches of black hair, which in the final instars, turn into golden patches of hair on the backside. The thoracical segments have long tufts of hair that are projected forward, along their heads. They seem to be rather polyphagous in nature and I bet there are many food plant options yet unmentioned by this website; experimentation will be worthwhile. I would not describe the caterpillars of E. folletii as gregarious, although they do seem to have social tendencies. In many occasions I have observed a few individuals feeding side by side from the same leaf. While they do not seem to travel and feed in groups and are more solitary than social, they do seem to meet up with other individuals of the same species briefly. 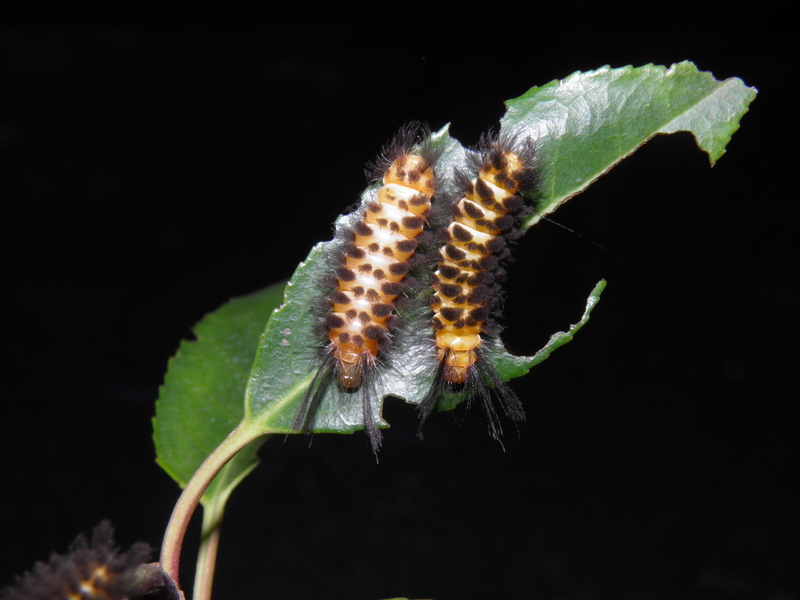 The early instars seem to like hiding on the underside of the leaves in the bottom of the container. 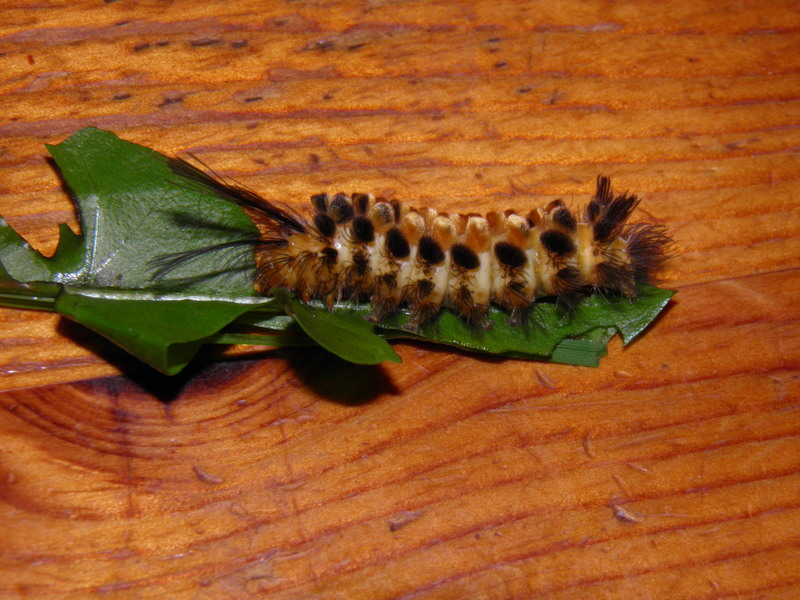 But as the grow bigger, the larvae become bolder, and the mature larvae are often seen wandering around, climbing the vegetation. Raising them is very easy if you keep them clean and well-fed. 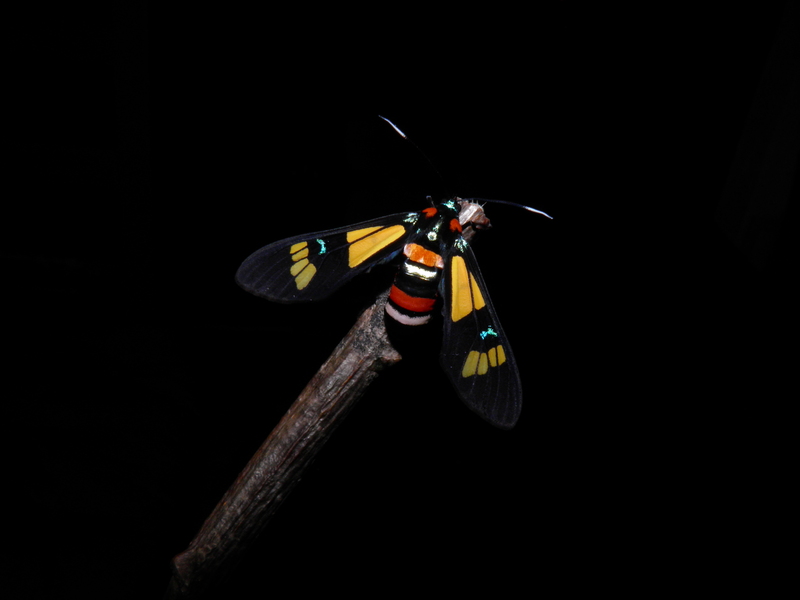 While most tiger moths tend to be slow growing and take several months to rear – even for the smallest of species – it seems that Euchromia folletii is a contrarian in this matter. Instead, I found the larvae to grow fast and well on room temperature (around 21 Celcius). I have reared them from egg to cocoon in a timespan slightly longer than a month. The moths hatch in about three weeks from their cocoons. All in all this makes for a short life cycle. 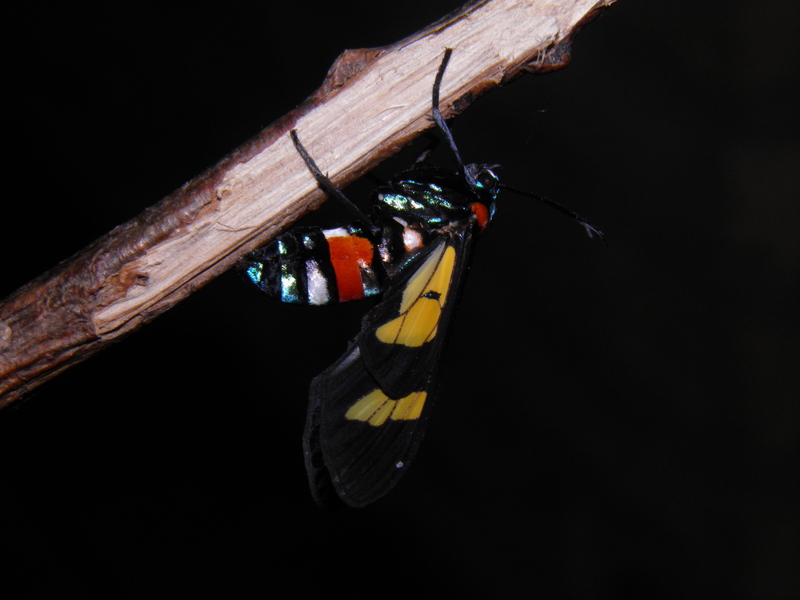 The adult moths have a suprisingly long lifespan for such a small species if properly cared for: one to two months. They should be provided light and food such as a honey/water mixture, or a nectar source such as flowers. They also need a little bit of ventilation although they do not appear to need much flight space. Males also crave minerals and will attempt to drink if handled by humans (possibly in response to the salt on human skin). They can be reared in airtight plastic containers, and do not seem to mind excess humidity at all – though it is important to keep them clean in these conditions to keep their container free from mold and bacterial growth. The larvae are extraordinarily fluffy, although these hairs do not seem to have any ill or irritating effects, they do use them to spin their cocoons. When the larvae are fully grown, they spin a patch of silk and settle on it. Next they will start spinning a silk cocoon around themselves, incorporating their own hairs into the lining of the cocoon! It is very interesting to see these fluffy larvae lose all their hairs and become almost pale and almost “maggot” like, as they spin more and more of their tufts into their silk encasing. After cocooning, expect to see the moths in 3 to 4 weeks. Though reasonably capable fliers, they behave lazier than most day active moths, and it seems that the adults occasionally stretch their wings and fly from place to place in small bursts of activity and then settle down again. In the wild, these moths possibly remain in the low vegetation, while they stray from flower to flower from time to time. As day fliers, their activity is stimulated by light. In summer, it could pay off to place the moths outside, in a cage in the sun. In winter, an artificial light that generates warmth and emits UV spectrum light will stimulate the adults. They can be fed honey/water or sugar/water mixtures aswell as flowers. The females lay eggs in clusters, preferably on their host plants, though they may lay them more randomly and scattered around if not provided sufficient host plant. All in all, Euchromia folletii is a truly beautiful species to breed and rear, both for beginners and experienced breeders. The male and female seem to have little difference in wingspan. Despite that, it is easy to recognise males and females as females have much bigger and plumper bodies and posture, while males have longer and more slender abdomens and thicker antennae. Males also have rather visible claspers that open if the moth is handled.